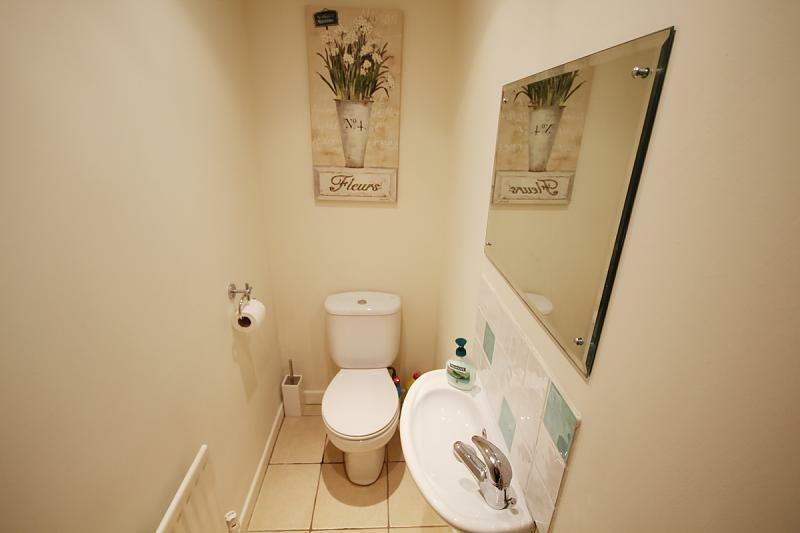 CALL MARTIN AT HOMEXPERTS RINGWOOD FOREST ON 01202 057599 TO BOOK YOUR VIEWING. 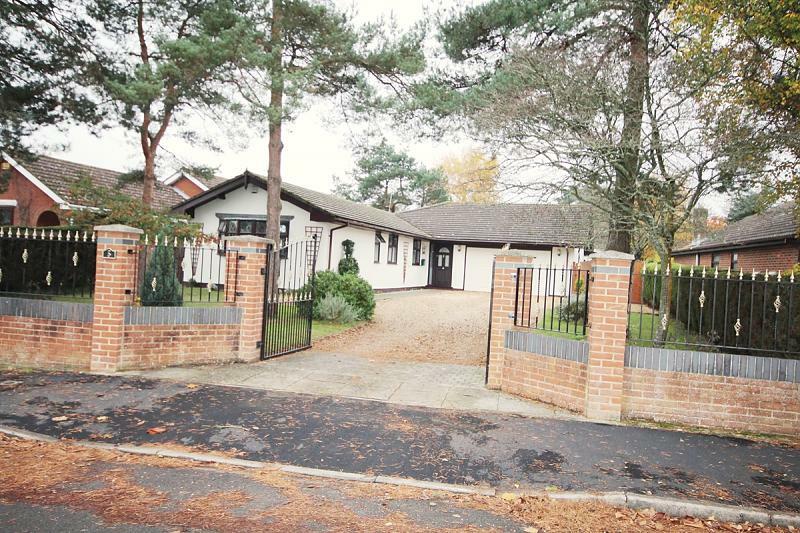 STUNNING MODERN 3 BEDROOM BUNGALOW. 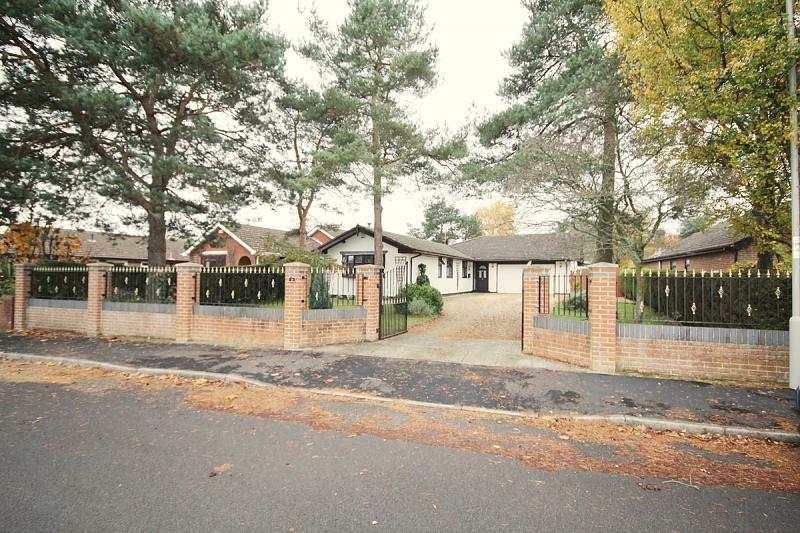 Located in a sought after location this bungalow oozes street appeal, with its attractive walled and gated entrance enclosing a sweeping gravel driveway. 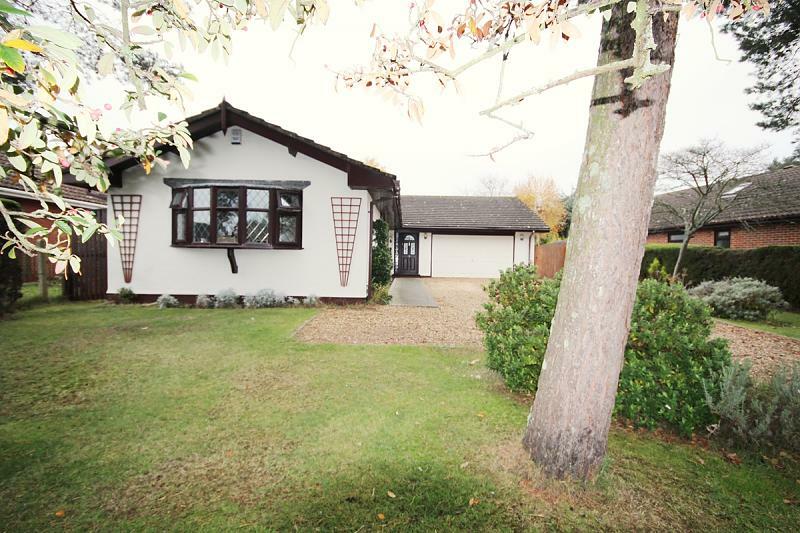 This spacious bungalow has been superbly maintained and enhanced by its current owners, with oak internal doors and flat finished ceilings throughout. 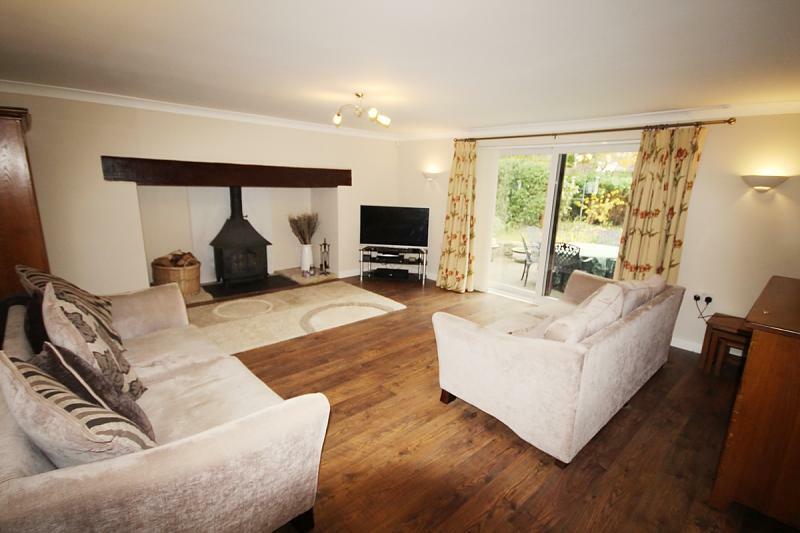 The centre piece of the property is the superb, living room with oak framed glazed double doors leading from the hallway, dark oak effect flooring, patio doors and a large feature fireplace framed by an oak beam which houses the delightful wood burning stove. The modern kitchen/dining room features white shaker style wall and floor units beneath a roll top work surface and contrasting tiled flooring. There are built in appliances which include Ceramic Hob & Canopy, Integrated NEFF Double Oven, Fridge and Freezer with ample space for free standing appliances. 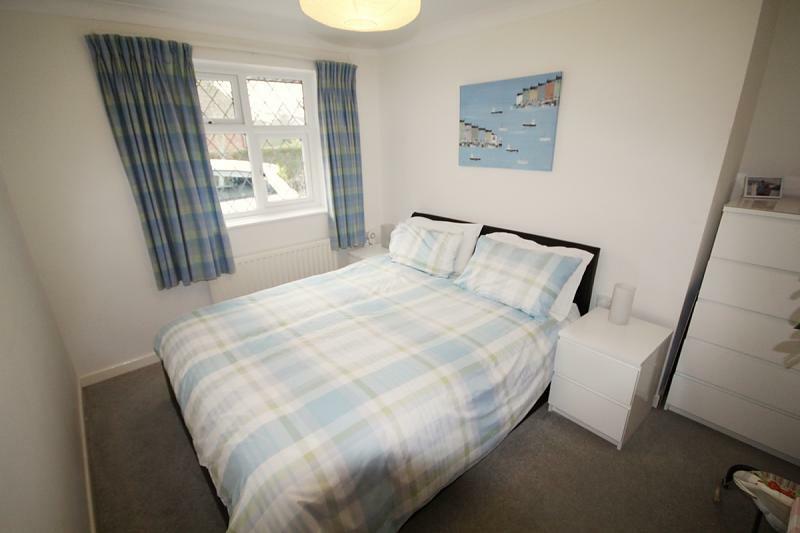 There are three double bedrooms, with an en-suite shower room serving the master bedroom, which also benefits from a range of built in wardrobes and an attractive bay window. 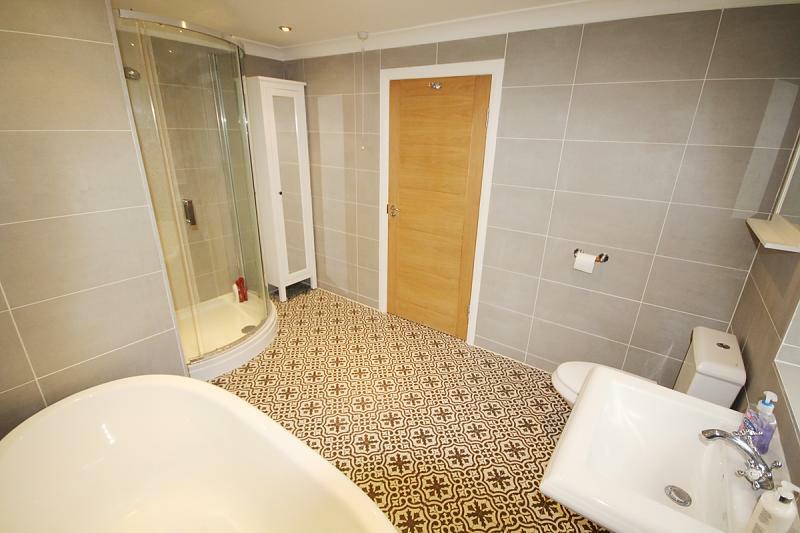 The large family bathroom has been recently refitted in a contemporary style and boasts a white suite with both a roll top bath and a large corner shower. 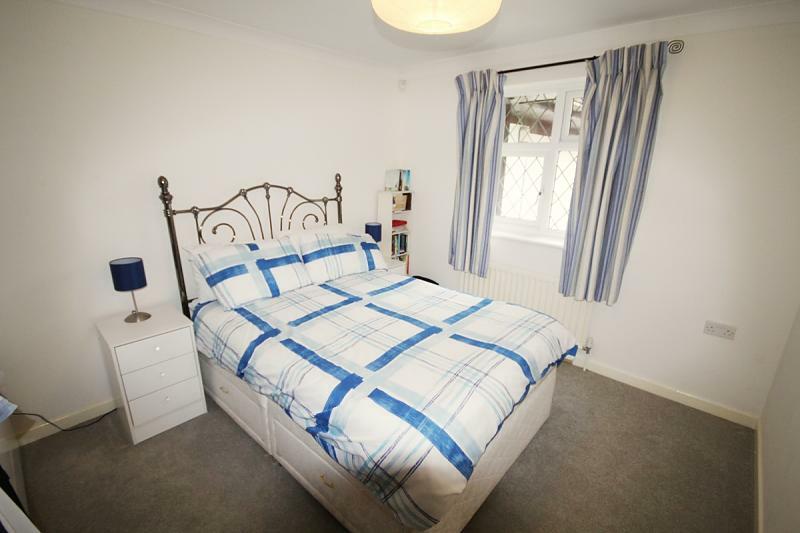 When you think you have finished exploring the accommodation you step outside into the private, sunny aspect rear garden which leads to an outbuilding fully equipped as an office with air-con heating, double glazed windows and doors and both electric and telephone sockets. There is a patio area to the immediate rear of the property which wraps itself around the side aspect where you will find a garden shed and side gate leading to the front of the property with its integral double garage, large gravel drive with parking for several cars and laid to lawn front garden bordered by mature shrubs and pine trees. On entering the property you step into a large welcoming hallway, which is set off by the high quality oak internal doors and contrasting dark oak wood effect flooring. 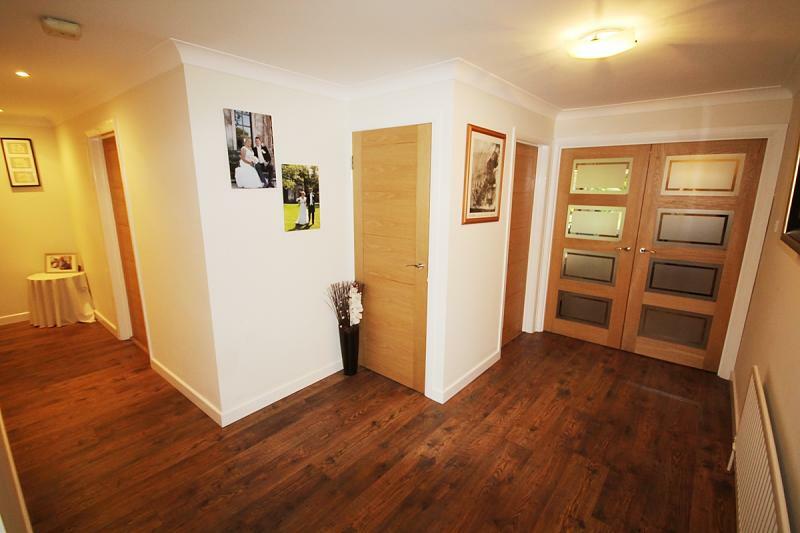 The hallway provides access to the living room via double oak framed glazed doors, which provide a striking and contemporary feel as you enter this superb bungalow. 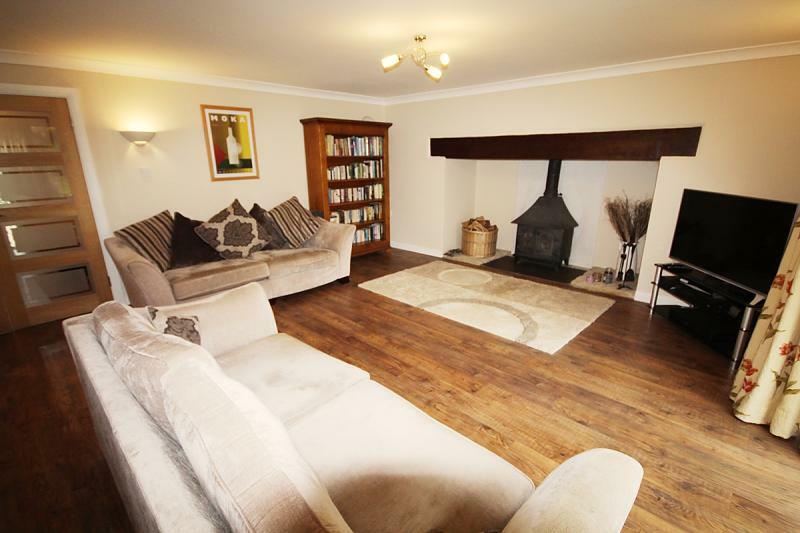 The centre piece of the property is the superb, living room with oak framed glazed double doors leading from the hallway, dark oak effect flooring, patio doors and a large feature fireplace framed by an oak beam which houses the delightful wood burning stove. There is an oak door leading to the kitchen/dining room. The modern kitchen/dining room features white shaker style wall and floor units beneath a roll top work surface and contrasting tiled flooring. 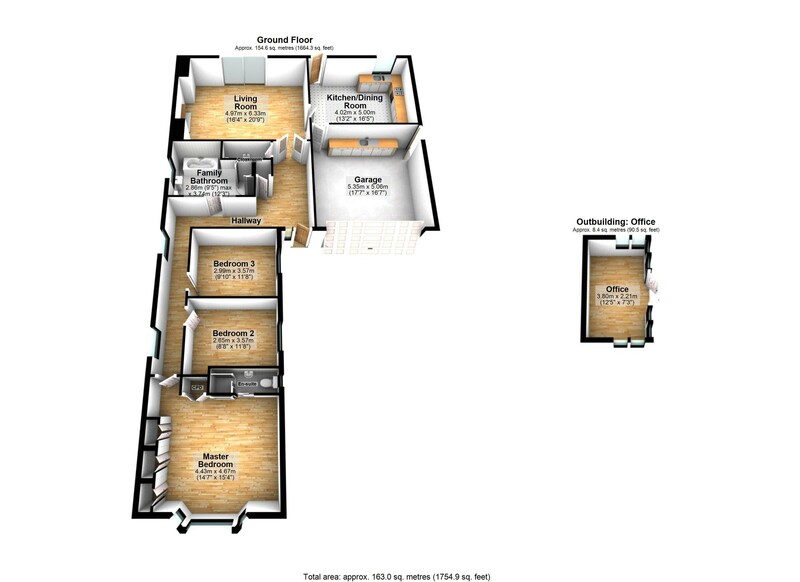 There are built in appliances which include Ceramic Hob and Canopy, Integrated NEFF Double Oven, Fridge and Freezer with ample space for free standing appliances. 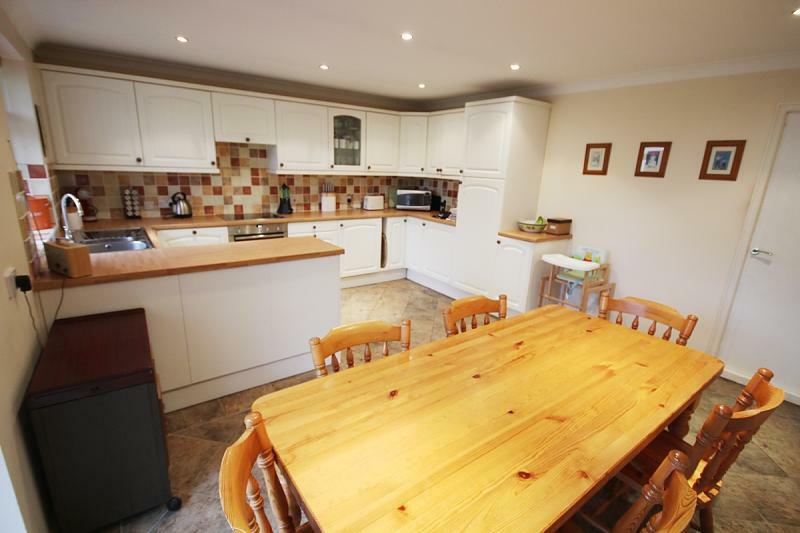 The kitchen has a window overlooking the rear garden, patio doors leading to the rear garden and a connecting door to the double garage which houses a utility area with stainless steel sink and drainer, space for free standing white goods. 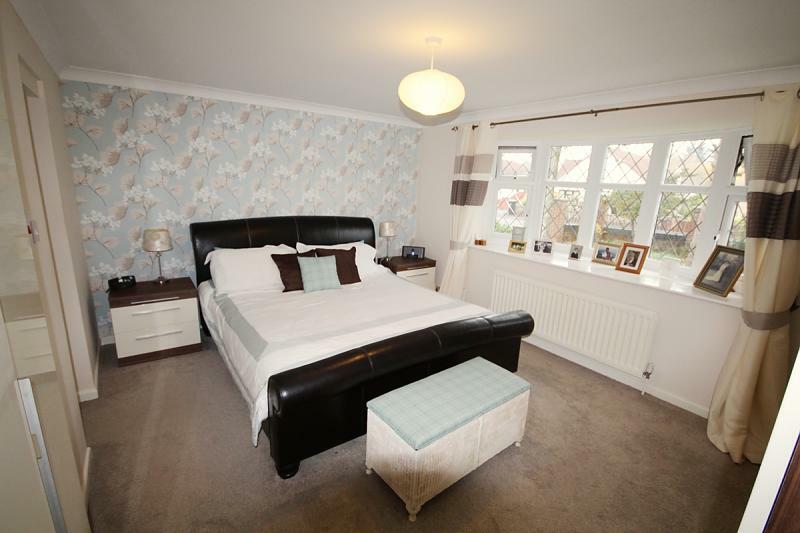 The master bedroom overlooks the front elevation via an attractive bay window and contains a range of built in double wardrobes and is serviced by its own en-suite shower room. 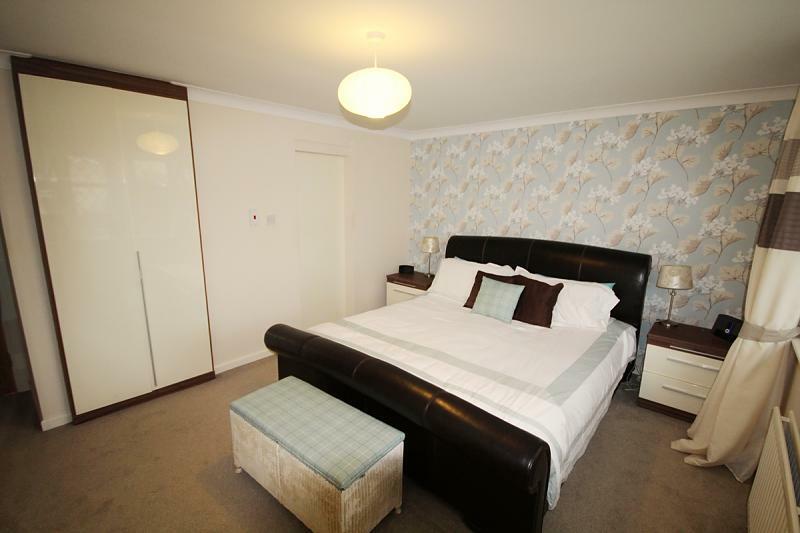 The en-suite to the master bedroom is fitted with a white suite consisting of shower cubicle, wash hand basin and w.c. There is a window overlooking the side aspect of the bungalow. Bedroom 2 overlooks the side elevation. Bedroom 3 overlooks the side aspect of the property. The large family bathroom has been re fitted to a high standard with a window overlooking the side aspect of the property. 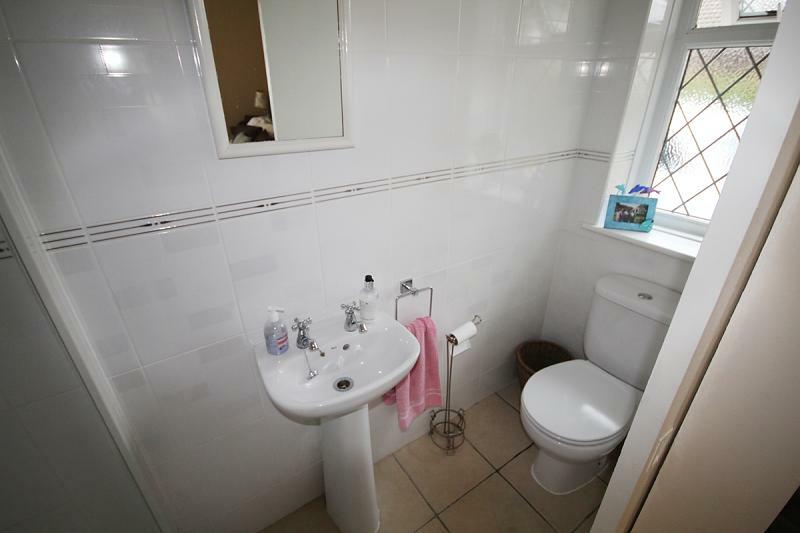 The bathroom is fitted with a white bathroom suite with chrome fittings comprising both a free standing roll top bath and a large stand alone corner shower. There is a rectangular pedestal wash hand basin and modern low level w.c with push button flush. 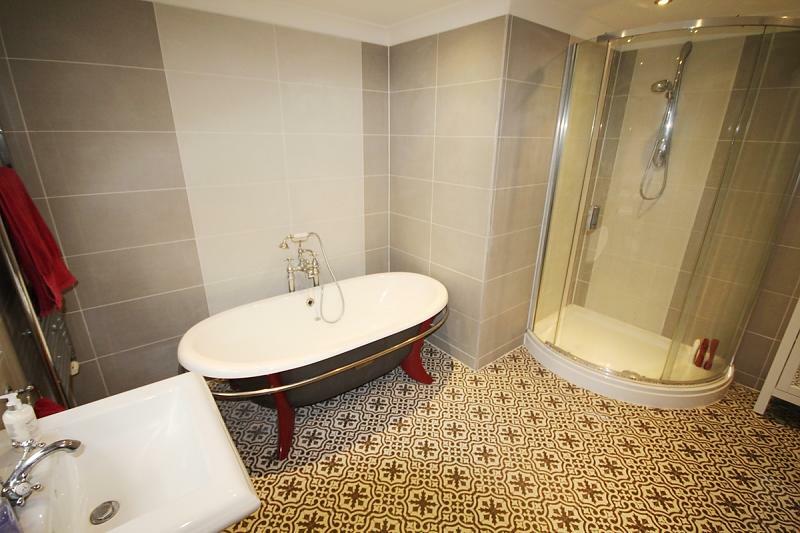 Attractive oversized tiling with decorative patterned flooring completes the modern and fresh bathroom decor. The cloakroom is accessed from the main hallway and comprises a white suite with wash hand basin and low level push button flush w.c. 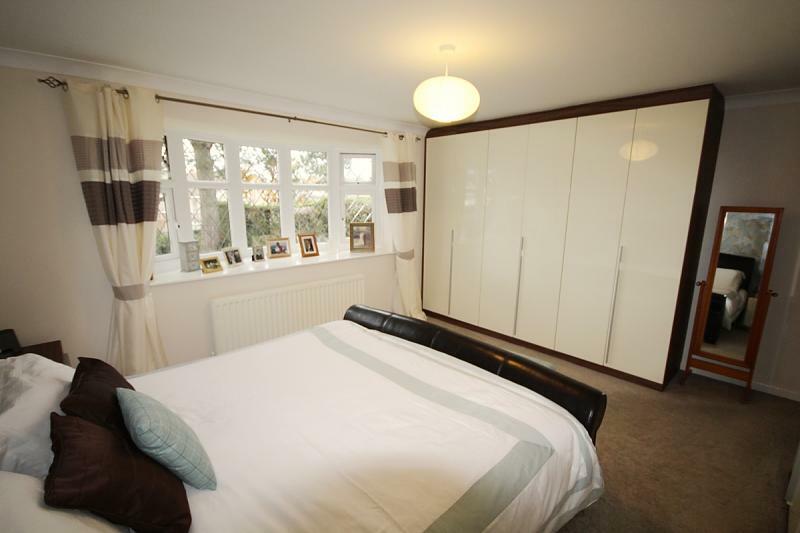 The property has an integral double garage with an electrically operated GRP up and over garage door. 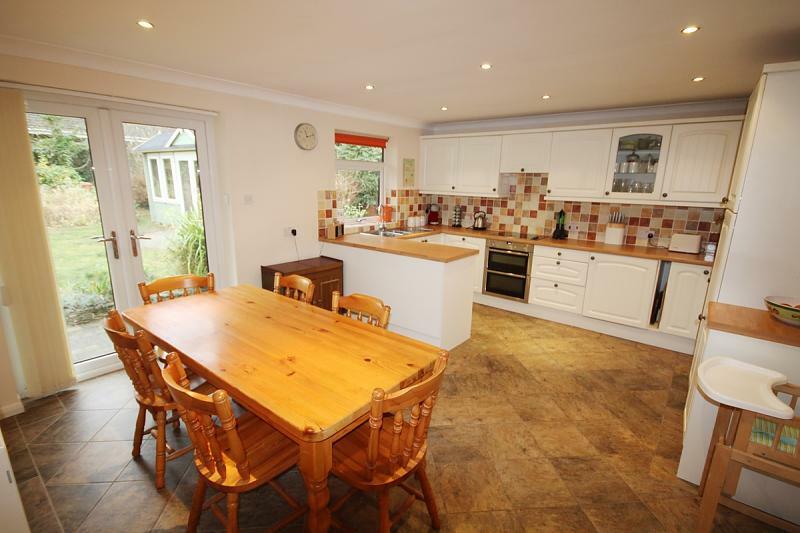 The garage houses the boiler to the property and also a small utility area with stainless steel sink and drainer set within a roll top work surface beneath which there is space for both a free standing washing machine and a tumble dryer. A side door leads to the side aspect of the property and an internal connecting door leads to the kitchen/dining room. 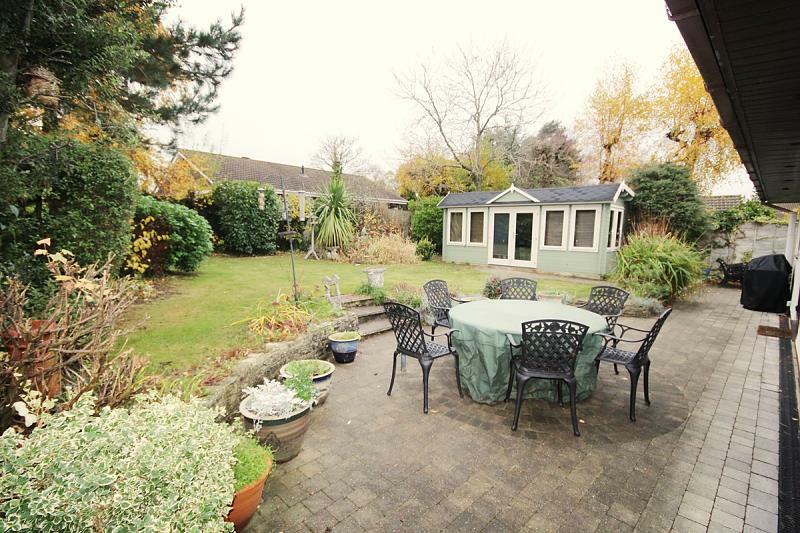 The rear garden has an attractive log cabin which benefits from both double glazed doors and windows. 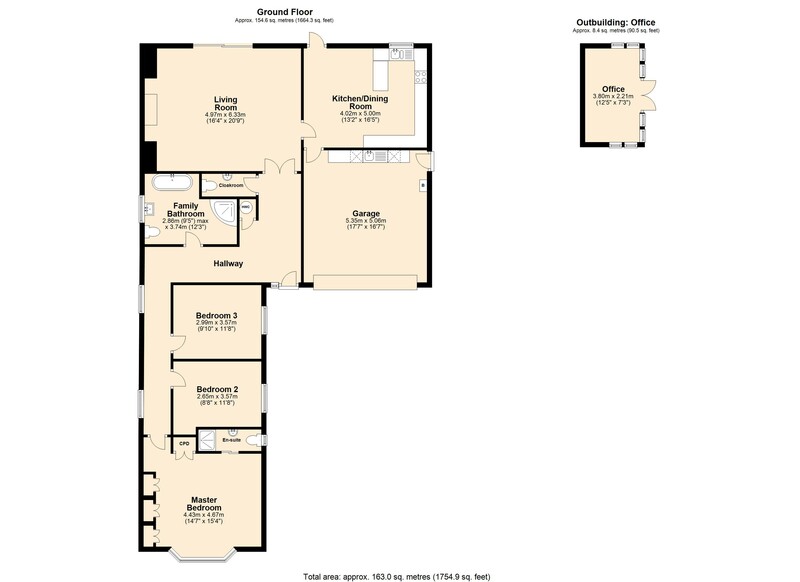 This building is currently configured as a work from home office and a wall mounted air conditioning unit provides heating during the winter months and cool air during the summer ensuring this building is useable during all seasons. Electric and telephone sockets ensure connectivity for office use. Outside, the street appeal of this bungalow is striking, with the front boundary wall, iron work and iron gates providing a striking approach to the property. 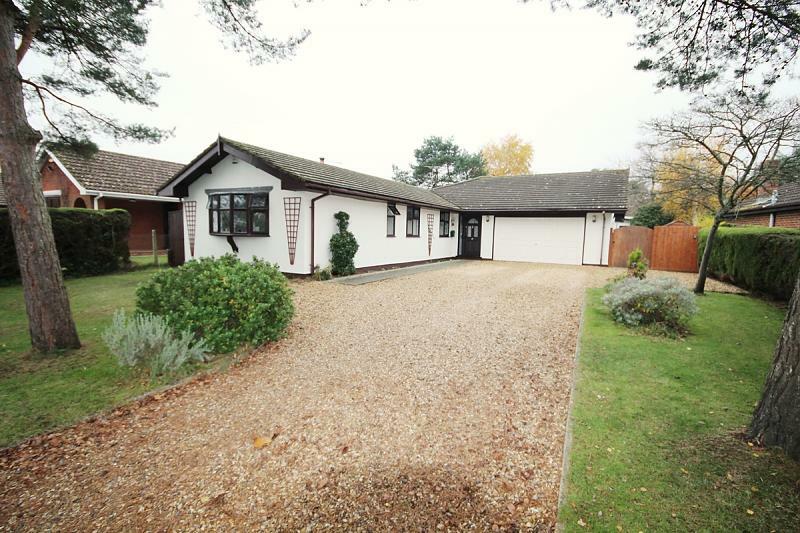 The bungalow has a large driveway with parking for several cars, which leads to a double garage with electrically operated up and over garage door and to the attractive glazed front entrance door. 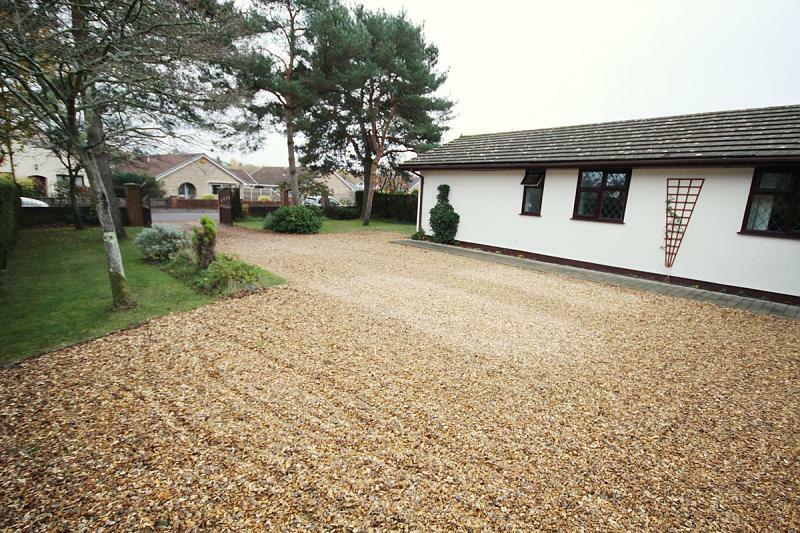 The shingle driveway is bordered by a laid to lawn area with decorative shrubs, interspersed by tall pine trees which provide a well maintained and attractive frontage to the property. 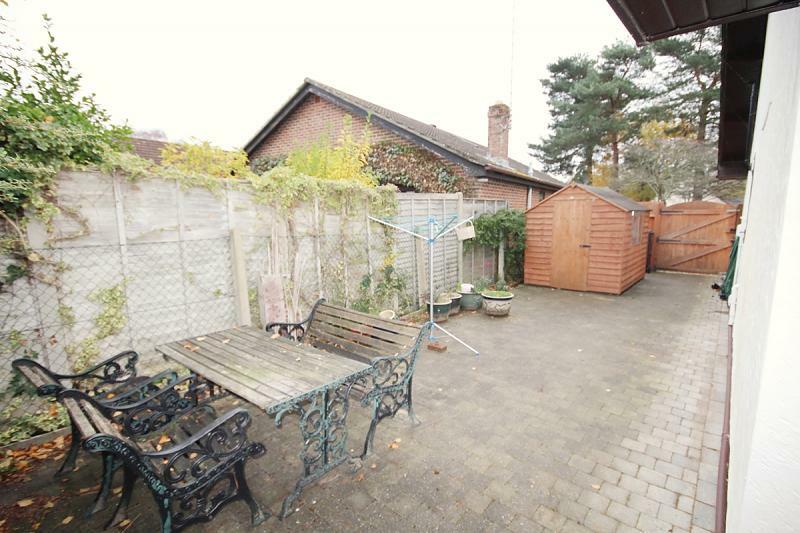 The sunny aspect rear garden is a good size and has a block paved patio area to the immediate rear of the property providing an area in which to just sit, relax and enjoy! The paved patio wraps around to the side aspect of the bungalow where you will find a surprising amount of space, housing a garden storage shed and side gate which provides access to the front of the bungalow. 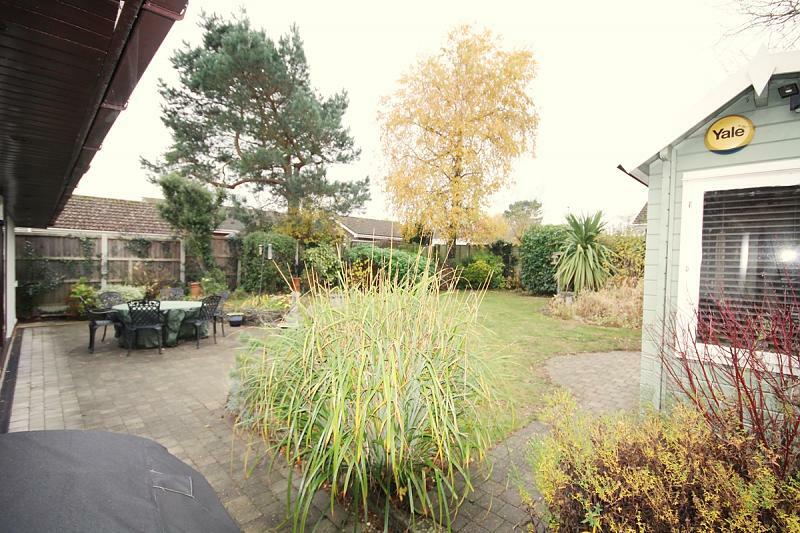 The Property is situated in a sought after location in Verwood, which is located within 5 miles of the larger towns of, Ringwood and Ferndown and 12 miles from the seaside resort of Bournemouth. Verwood has nearby transport links with the A31 and A338 trunk roads providing easy access to the M27 and M3 meaning the cities of Salisbury, Southampton, Winchester and even London are never far away with mainline train stations at Bournemouth and Southampton located 15 and 27 miles away respectively.